Everyone's favorite killer doll returns - as the Chucky legacy continues with the introduction of an all-new family member! This time around, Chucky (voiced again by Brad Dourif) and his homicidal honey, Tiffany, are brought back to life by their orphan offspring, Glen. Then, the outrageous action goes Hollywood, as Chucky and his bride take Tinseltown by storm, unleashing a wild new rampage of murderous mayhem! Featuring Academy Award nominee Jennifer Tilly (as herself and the voice of Tiffany) and hip-hop star Redman, it's all about family values, Chucky-style! 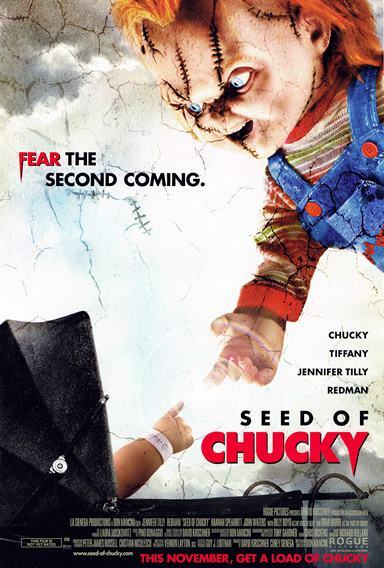 Download Seed of Chucky in Digital HD from the iTunes store. Seed of Chucky images are © Rogue Pictures. All Rights Reserved.